Like so many other crafts in the past few weeks, I was inspired when I was trying to come up with something for the #PowerOfPlay52 prompt on Instagram. Something fun and new for me to do with my kiddos, that might be sneaking in some learning when she doesn’t even know it! 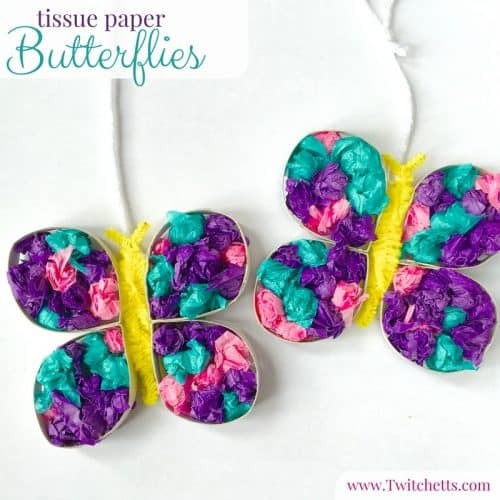 Following the week’s prompt V and I really enjoyed creating these tissue paper butterflies. 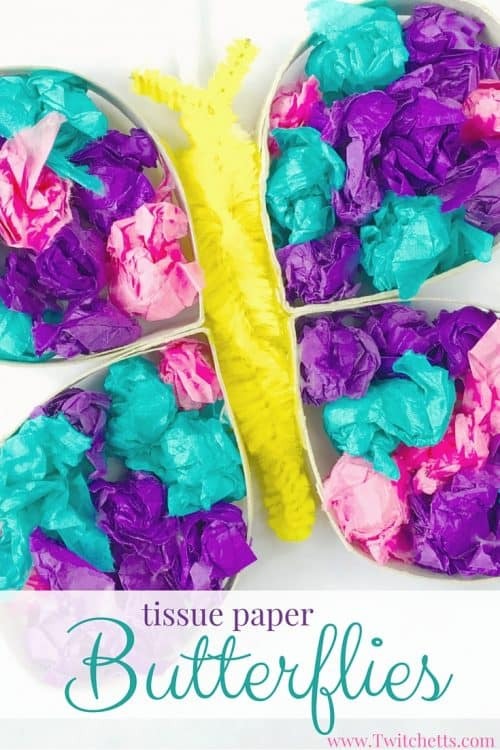 I know there are tons of tissue paper butterflies out there, but these are different. Your little ones can use a bit of fine-motor skills to create these beautiful masterpieces! Tissue paper. As many or as few colors as you like or have. A pipe cleaner. 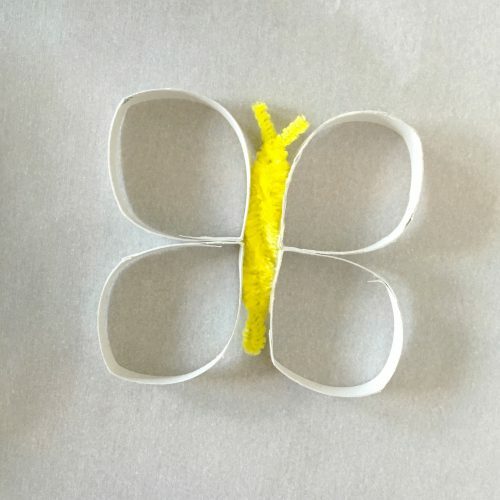 One pipe cleaner will make 2 butterflies. String. Optional if you would like to hang them up. Start by creating your wings. 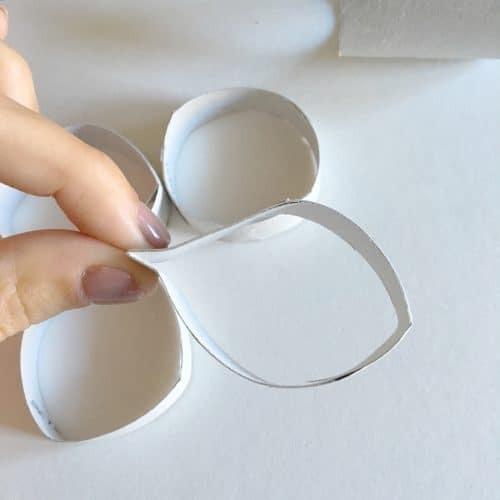 Cut your toilet paper tube into rings. Pinch your rings into a tear drop shape. You can make them as thick as you like, but I did ours about a half an inch thick. 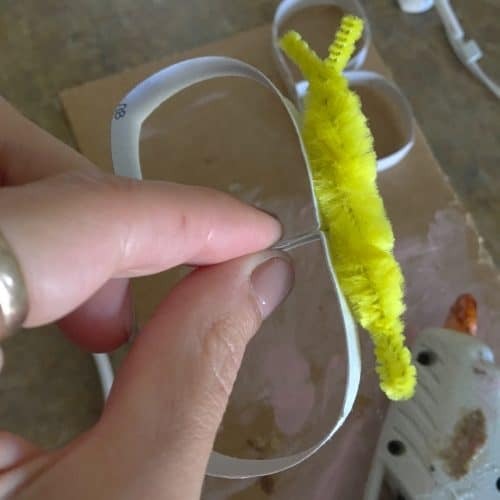 Cut your pipe cleaner in half, then fold in half. Twist it together then part the tips to make antennas. 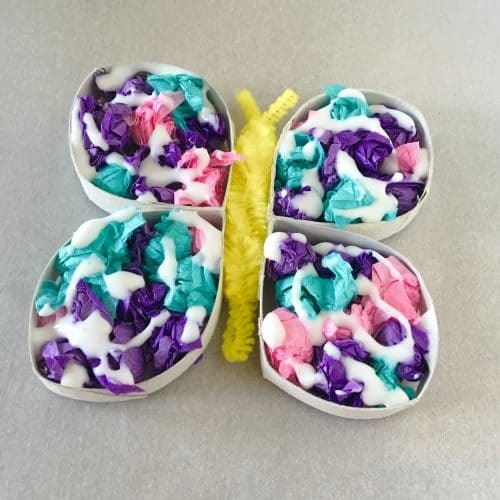 Assemble your butterflies for your little ones. 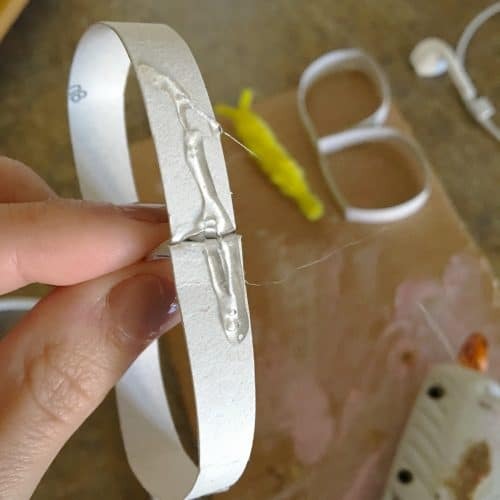 Attach the upper and lower wings with a dab of hot glue, then using more hot glue to add your wings to your bodies. 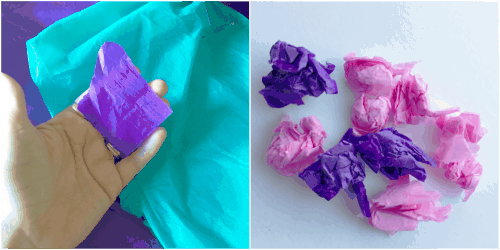 Rip your tissue paper into small square-ish shapes around the size of the palm of your hand. These do not have to be precise. Then have your little one crumple them up into small balls. You can help with this if they are too young. 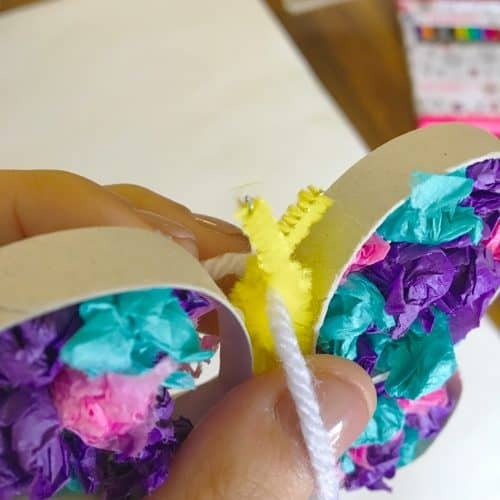 Next, have them fill in the wings with these small tissue paper balls. When they have them perfectly placed swirl white glue around the top and let dry completely. If you would like to hang them simply untwist the top antenna and slide in a piece of string or yarn then twist back together and hang! Then you are done! This is such a great craft for your kiddos because of all of the fine motor work they do, without even knowing it! 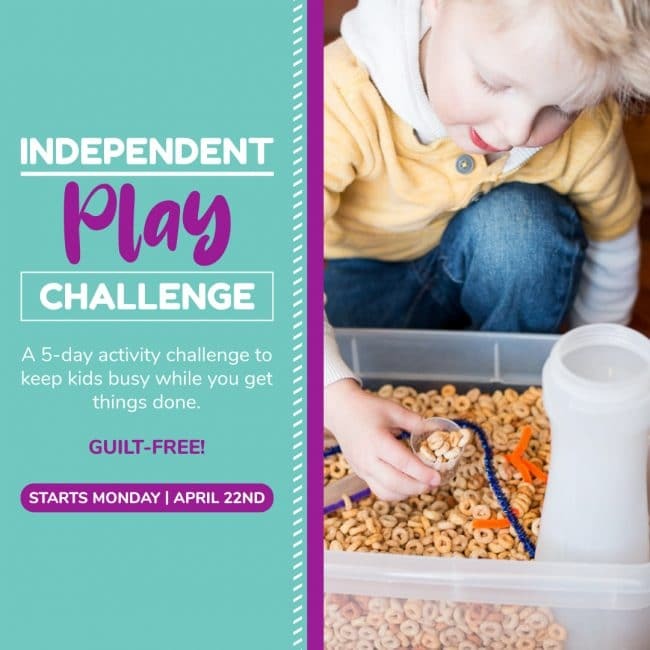 I hope you enjoy this activity with your little one! Just another reason why I keep the tissue paper from gifts!